A huge crowd of eagerly awaiting people shift impatiently in a long line that stretches around the perimeter hallway of the Pasadena Convention Center. On the other side of the doors, the rumbling reverberates through. Volunteers in bright blue T-shirts keep them at bay. Precisely when the clock strikes ten o’clock, they start to flood through the entrance into the exhibit hall. Dozens of vendor booths are ready for them. It’s like a color explosion and major sensory overload. Some of the booths are set up as a funky lounge, others have life-sized games splayed out on the floor, while the fabric businesses have stacks and stacks of beautiful prints displayed. Someone with Windham Fabrics hands each person a fabric-covered necklace as they walk into the space. 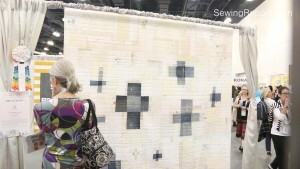 People can be seen immediately starting to ooh and aah over the walls and walls filled with quilts – photographing one in particular that has a cream background and inset crosses made of blue denim. The title is ‘My Brother’s Jeans’ – handcrafted by a woman named Melissa Averinos in memory of her brother, who committed suicide. Averinos took home the 2016 Best in Show prize. They are here for QuiltCon – the annual gathering for lovers of the modern quilting movement. It’s a quilt show, competition, and convention – featuring a quilt walk split up into two buildings, lectures, panels, and workshops. Jacquie Gering, President of The Modern Quilt Guild’s Board of Directors, explained that while previous events were held in Austin, TX – organizers wanted to bring it to a different geographical area for 2016. “It’s the time for our members to come together, be inspired by each other, learn from each other and see each other’s work,” she noted. 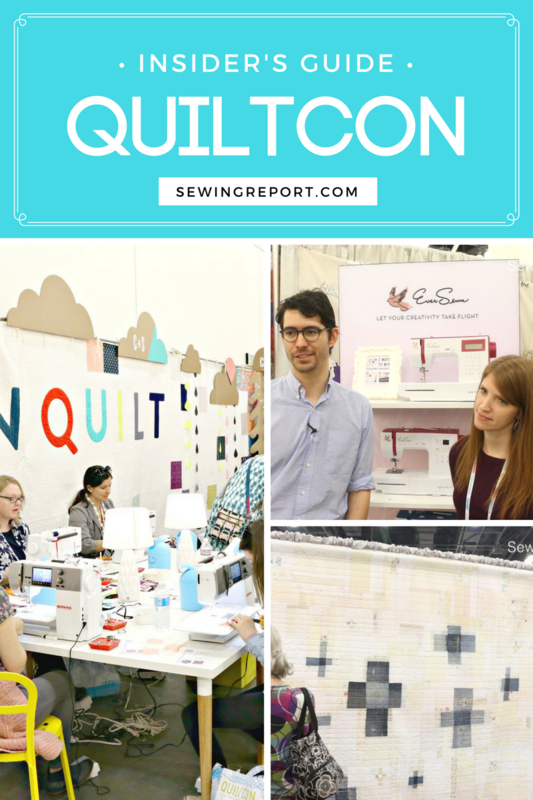 QuiltCon East will be held in Savannah, GA in 2017. 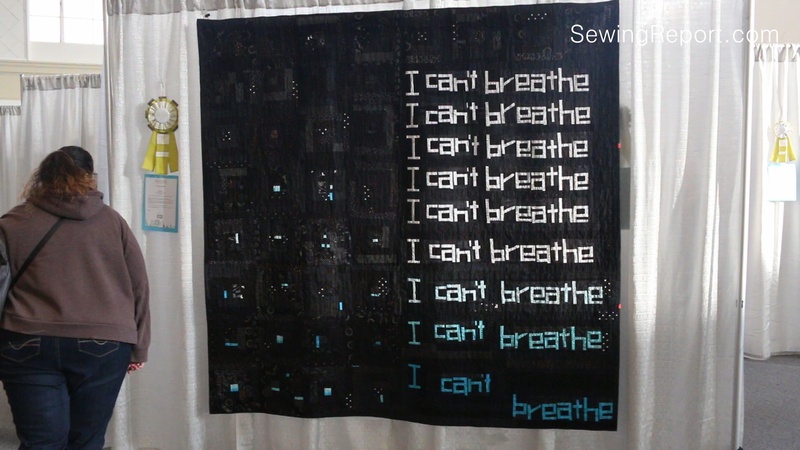 There is considerable buzz for another quilt: ‘The One for Eric’ – made by Chawne Kimber and inspired by the death of Eric Garner at the hands of a NYPD officer. It won 1st place in the Improvisation category. While popular culture would lead you to believe the majority of the attendees are female and senior citizen, that couldn’t be farther from the truth. There are members of both sexes of all ages, individual style, and nationality. A man with a Mohawk dyed bright red, babies, couples, groups of friends who traveled together. During QuiltCon I encountered two women from Japan, another from Tasmania, and a couple from the Netherlands. It’s a place where you can show off your handmade dress, shirt, or bag. Meet up with Instagram buddies and end up drinking and talking late into the night at the hotel bar. Did I mention that Dennis is trying to convince Pat she should get a longarm quilting machine? He has even done the math to calculate how many quilts it would take to break even or profit on the investment. Rumors start to fly around that an actress was spotted at QuiltCon, which appears to excite and energize pockets of the quilters. YouTube star Melanie Ham, who lives in Southern California, came to check out the show. Ham has gained internet fame through video tutorials on sewing, crochet, and DIY. Ham has a bright, exuberant personality and over 236,000 subscribers on YouTube (as of February 2016). 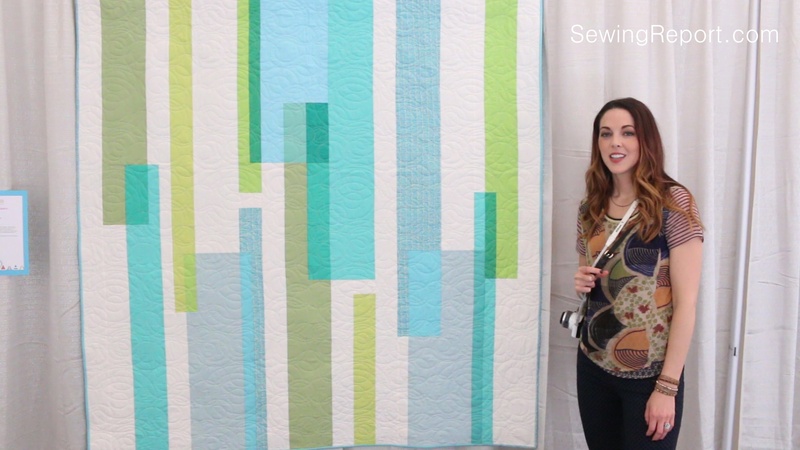 She is part of a new wave of makers who have attained “sewlebrity” status. A sewlebrity is a sewing celebrity, usually someone who is well known for their blog, books, teaching, videos, or pattern designing. Many of the vendors travel the sewing/quilting event circuit year round side-by-side. It’s almost like they are colleagues, except for the fact that they’re technically competition. Through the process they’ve become a family of sorts living life on the road, lugging product across the country. A couple vendors (a graphics/photography business and a book publisher) even decided to team up and share a booth to defray costs and support one another. They tag team manning it throughout the event. The sewing industry is comprised of quite a few family owned and operated businesses. Hoffman Fabrics, based in Los Angeles, is currently on the fourth generation of leadership with Hailey and Aaron Hoffman. The cousins are two of several family members working full-time in the company – founded in 1924. Aaron appreciates QuiltCon’s educational aspects. “That’s what’s probably the coolest thing about it is that there are all kinds of different classes,” Hoffman said. Aaron is the director of the contemporary Me+You collection – the first to shift away from Hoffman’s previous lines of traditional batiks. It is very evident the cousins realize how meaningful the Hoffman legacy is. 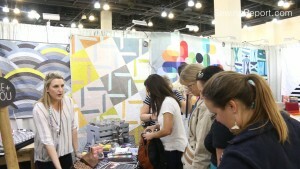 They are at the booth all four days working – talking about the fabrics and selling yardage and bundles. On Friday, their 84-year-old grandfather, Walter, makes an appearance to survey the scene. He is decked out in a Hawaiian shirt and a team member proudly tells me he was out surfing earlier in the morning. Philipp Ueltschi is the rising fifth generation for Bernina sewing machines, the brand many view as having a cult status. He is heading up the launch of a new line of entry level machines called EverSewn – targeting a different customer base than the high-end models. “My role is to bring EverSewn to the next gen consumers and bring new, young people into the sewing world,” he says with an infectious smile. Ueltschi speaks four languages, and really seems to be in his element around the quilters at QuiltCon. He describes how his father HP is a “rock star” in the sewing community. And I did locate a YouTube video in which HP is signing customers’ sewing machines. With few family businesses succeeding in transitioning to new generations, they have accomplished a feat that’s proven challenging in the standard business climate. 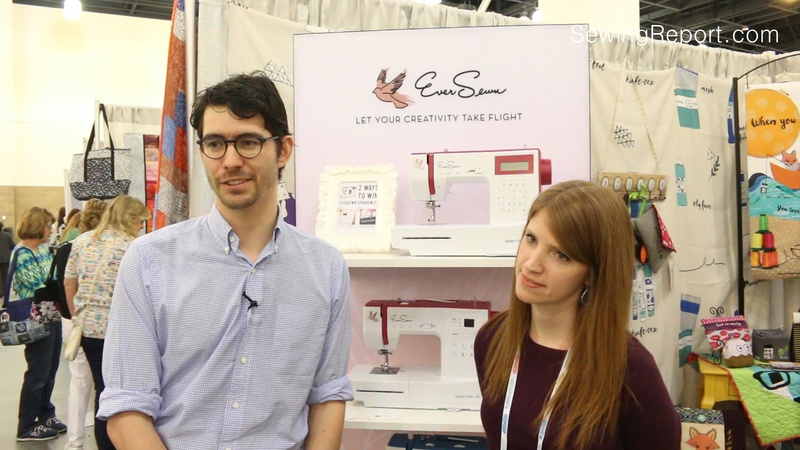 On the last day of the show, Aron Schleter, who works in sales for Moore’s Sewing, bats around ideas for viral YouTube videos he could help make for the store. These businessmen and women are injecting a fresh voice and ideas into an industry long depicted as conventional. Suzy Williams traveled for the first time to QuiltCon from Chicago, attending on Thursday to see her three accepted quilts displayed. Like many others, she doesn’t know what to expect. Williams has garnered an impressive social media following on Instagram – known for her cheeky, bright, and cheerful photography. Williams has a background in graphic design, and has transitioned into designing quilt patterns. 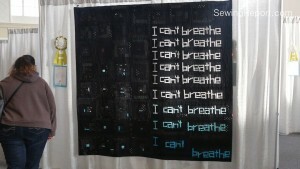 Like many quilters, Williams admits that at times she feels isolated from other makers. During Mary Fons’ Saturday lecture on the Great American Quilt Revival, she took the opportunity to address something that’s weighing on her heart. The elephant in the room, as she puts it. A controversy involving male quilter Luke Haynes and his new exhibit of log cabin art quilts. “As soon as you put that thread to fabric in the 21st century, you are entering into a discussion about feminism, about art versus craft, and about gender,” Fons pointed out. According to Fons, there’s some hubbub over Haynes hiring women to help him make the 50 pieces for his collection. Fons’ words are impassioned, fierce, and take-no-prisoners. Regardless of the matter of opinion – quilters do mainly agree on one issue: encouraging new quilters. Thanks for this even-handed report. Glad to see such a full report. I spoke you the first day you were setting up your camera. So happy you enjoyed the show. Thanks for the great report. I would love to go to Savannah next year. What a wonderful take on the show Jennifer! I love this style of reporting; honest, engaged, thorough, keep doing what you’re doing! Thanks so much Molli! It was a bummer that we didn’t run into each other there – you are still on my sewlebrity bucket list!